Our proprietary Emini S&P trading signals and trading models are designed with long term stability in mind. 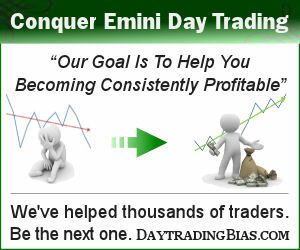 Daily bias reports are updated within an hour after US stock market close. Many of the swing trading setups and day trading biases can be used discretionarily or mechanically. Read the linked research articles for past performance and engagement rules. Our real-time trading tools are trading platform independent. All you need is a browser to use them. The real-time trading tools are designed to complement the regular trading tools a day trader use so that better trading decisions can be made. We’ve tested our real-time trading tools across all the major browsers and they should all be compatiable. All these instruments are closely related and they moves in sync most of the time during US market hours. By understanding the behaviour of the cash index itself and/or the dominant derivatives like SPY and Emini S&P (ES) will enable you to better time the related markets as well. ** performance as of the initial release date of the model. Annualized return based on percentage gain on trading one unit of the instrument without leverage.